Kate recounts the first leg of their sailing trip from New England into Virginia. There are plenty of ways to get from New Bedford, MA to Norfolk, VA in a small sailboat. There are multiple slow routes and then there is the one fast route. From the south coast of Massachusetts, you can poke around the relatively protected waterways of the Long Island Sound, exploring the bays and inlets along the coasts of Rhode Island, Connecticut and Long Island. Then you pivot south, through the dynamic open waters of New York City, where there again are many interesting places to tuck in, like City Island, my old stomping grounds of Newtown Creek and multiple boat basins on the Hudson shores of Manhattan and New Jersey. Onward through the NY Harbor, you pass the Statue of Liberty and head down the NJ shore. That route would have been just lovely in September, and we surely would have lingered for weeks visiting friends along both angles. But we were running late, and we had no time to dally. So we pondered the hypotenuse, the straight shot through open waters, landing at the southern extreme of New Jersey, or aiming directly for the Chesapeake Bay. The straight shot would mean a minimum of 40 hours offshore, probably more, sailing continuously with no auto-pilot in cold and possibly in rain. We knew we needed help. That is how Fabio’s friend Roberto came to join us for the first leg of SY Tranquility’s voyage south, to enable us to attempt this fast route. Roberto is from Genoa, with a proper salty lineage (not like us two knuckleheads) and also has the spirit for adventure that would find our small, simple boat appealing. 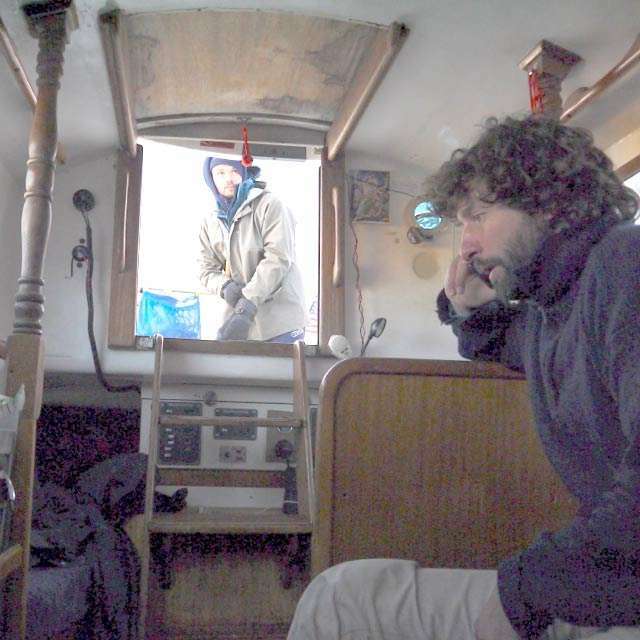 Roberto, off duty, inside of the SY Tranquility, while Fabio works on deck. We made it to Block Island safely in one day, leaving at the first sign of wind and arriving in the pitch black night, to a closed marina. The whole island was in winterization mode, with none of the tourist amenities operating, and only the hardy, full-time residents were left on the island. This is where I learned to take a bath with literally one cup of (cold) water. We spent two nights on Block Island awaiting the perfect wind and set out on the third night for the big crossing. The weather was ideal, considering that we could have been sitting in the dark in an open cockpit under freezing rain…instead it was just cold. We made it 65 hours and almost 400 miles, as far as Wachapreague, a small town in Virginia on the cape that forms the northern entrance to the Chesapeake Bay. We were grateful for the crab bisque, hot showers and moment of rest in this self-proclaimed “flounder capital”, but we set out the next day to race on to Norfolk, ahead of some bad weather we expected behind us. 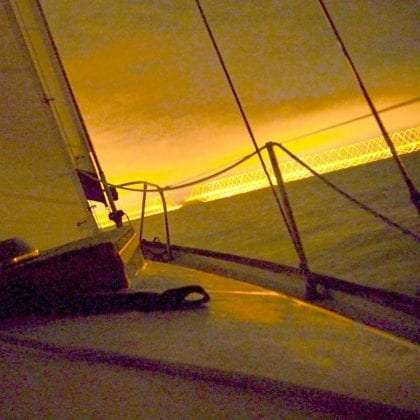 That night we enjoyed a slow approach, admiring the lights of the massive bridge that spans the mouth of the Chesapeake, followed by a great gust (the beginning of that weather that I mentioned) that sent us charging in through the towering naval ships of Norfolk and Hampton Roads. In Italian, that type of entrance could be described as impressionante. In English sailor-speak, they just call it “sporty”. Good read. My brother and sister in law departed July 1, Norfork to Mattapoisett Ma near New Bedford though they are in no hurry mode. First long sail for them and should arrive in Mattapoisett Friday Aug 4. Quite the undertaking. Of course. they need to return to Norfork. I’m planning to sail from Padanaram to the Chesapeake in Fall 2019. Sounds like a 3 night sail. Will be my longest sail as skipper.